It’s dry this summer. It seems like we are either watering, or obsessing about whether we are watering too much or too little. Nobody wants to over water fruit trees. Why waste water. Excess water creates more tree growth, not more fruit, and results in nutrient leaching. Ideally, we are watering just the right amount to maintain a healthy disease resistant tree but also good fruit production. Cliff Mass’s August 24 blog says July and August 2017 combined will be the driest in 100 years. That sounds dramatic. However, data for 2017, in relation to 2016, shows only slightly higher temperatures and only 1.12 less rain over the period June, July and August. Why is 1.12 less rain making such a big difference? Let’s say you were comfortable with your 2016 watering, meaning the trees are healthy and the fruit set was reasonable this year. You are watering about the same this year but now you want to make up for the fact that we have had less rain in 2017. If we estimate the active root zone of our tree to be 100 square feet and we want to add that extra inch of water, then we need 8.33 cubic feet of water or 62 extra gallons! How do the Pros Efficiently Use Water? To improve water efficiency, you have to know how much water you use and we do because we water with 5-gallon buckets. Pros take into account the amount of water lost from the trees pulling up water through their roots and pushing it out the stomata of their leaves (transpiration) and also how much water evaporates from the soil into the air (evaporation). The combined effect is evapotranspiration (ET). ET models are largely based on temperature and are based on water use of alfalfa (Eta) or on grass (ETo). Each crop uses a certain percentage of the water that alfalfa uses and that is the crop coefficient (Kc). An apple orchard with active ground cover has a .8 Kc at initial stage of fruit development, then 1.2 mid season and .85 at end of season, prior to leaf drop. There are many variables to consider other than temperature and crop coefficient, like wind, leaf growth, humidity, day length, soil type, and intervals between watering. However, for ease, if we think of the apple crop coefficient at 1.0, then we can use ET as a guideline for irrigation. If you log into WSU Weather AG and click on Irrigation, Irrigation Scheduler, you can enter your location, a crop and your soil type and it will tell you how much water the apples are using (ET), how much precipitation we have had and, most importantly, it will show you the water deficit, including the cumulative deficit. The cumulative deficit as of August 27, beginning from May 21, is 5.3 inches. That number will be in red. You don’t have to add 5.3 inches unless you have not watered at all this summer! 3) bitter pit in apple, or increased cork spot and “hard-end” in pears. 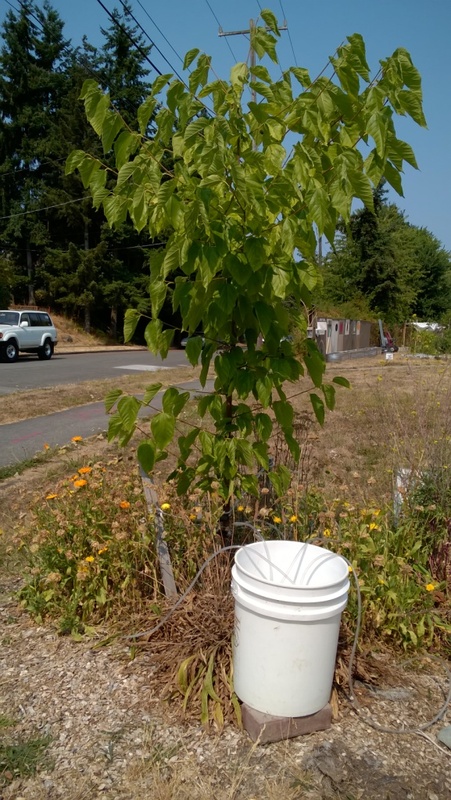 Stay tuned as we consider writing for a grant to apply more water conservation strategies at the orchard. This entry was posted in Plants, Uncategorized and tagged deficit irrigation, drip line, evotranspiration, water efficiency on August 28, 2017 by Ruth. Well, no. Actually, the case of the missing spaghetti squash. Laura and Mitch, new gardeners in the orchard, plopped in some squash starts Memorial Day weekend and by the end of July their garden bed was busting with yellow footballs. We were all under the assumption that they planted summer squash. 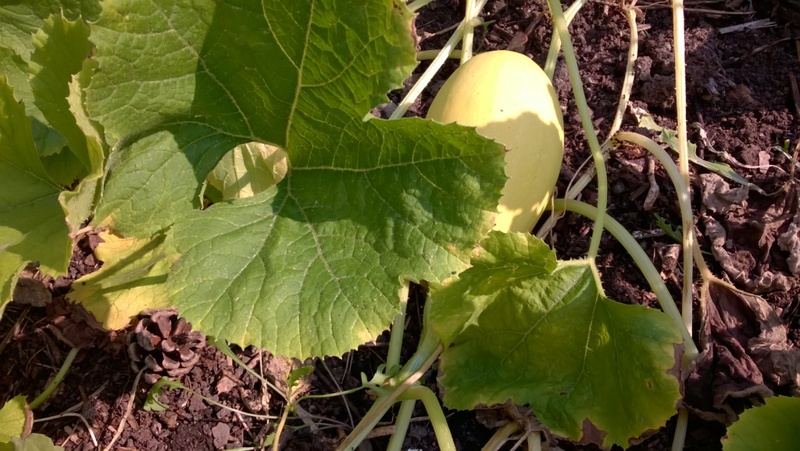 (Winter squash is tricky west of the mountains and usually takes 90 to 135 days to mature. We were afraid they forgot to harvest so I sent an email letting them know they might want to pick when the squash was small, about six inches, for the finest quality. A few days later, I discovered seven yellow squash were on the ground, lined up along the path. I scratched my head and decided Laura had taken us up on our offer to include them in the next load for the food bank. I carted them home for safekeeping so the rats wouldn’t take notice. We were humbled. Laura and Mitch had pulled out a dozen spaghetti squash before the end of July! That is truly a gardening success. The rest of us will be paying more attention to the moves these newcomers make. Please consider joining us Wednesday evening, August 16, as we make another food bank bed. 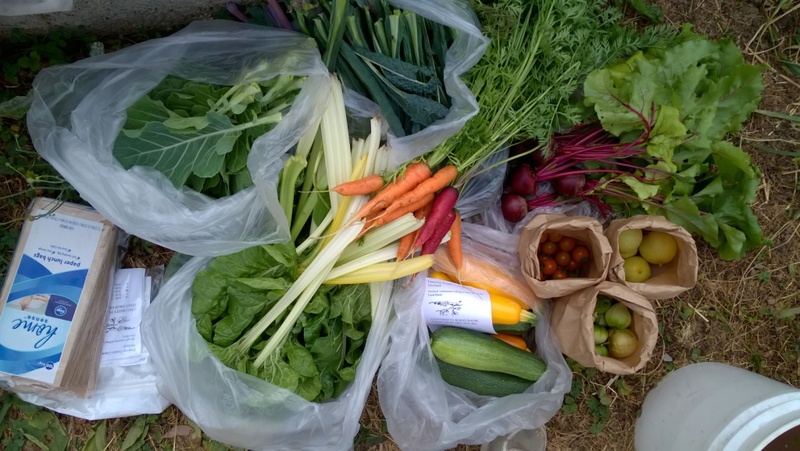 Thanks to Sue for last week’s harvest (see photo). This entry was posted in Plants, Uncategorized and tagged food bank, gardener on August 6, 2017 by Ruth.